The more realistic input assumptions mean the result is 56% less traffic on the toll road, and 50% more on the existing SH1 than NZTA’s forecast. This is significant, not just because 6,031 really is a pitiful amount of traffic for a $760m toll road, but because one of the objectives of the toll road is to reduce congestion at Warkworth. 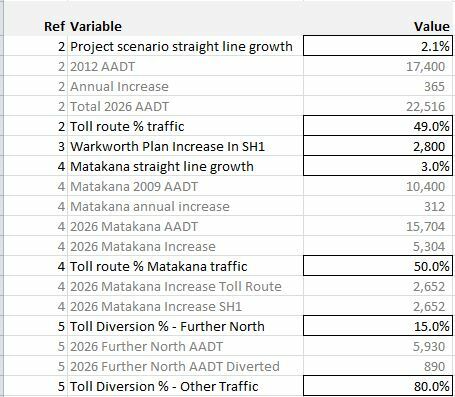 Current AADT volumes are about 17,400 veh/day, so traffic volumes of 21,788 represent an increase in traffic volumes of 25% by 2026 on the existing SH1. Without improvements to Hill St, delays will get far worse after the project is completed. It also means the claimed safety benefits are doubtful. There aren’t any safety improvements proposed for the existing SH1, so the number of accidents will be higher than NZTA’s report also. I’ll be talking more about this in a subsequent post. Project scenario straight line growth. Although the NZTA’s own Economic Evaluation Manual stipulates a zero default growth rate should be used, I have based growth on the historic trend of 2.1%. Incidentally if you use a higher growth rate than this, more traffic results on SH1. Toll route % traffic: This is the split of traffic assumed without a toll. I’ve simply used the same split identified in the original report. Warkworth Plan Increase in SH1: The 2,800 increase in traffic on SH1 comes from Test B of the original report. I’m assuming this because most new growth is currently planned to be in the west and south of Warkworth. Obviously if there is an increase in traffic on SH1, there must also be a reduction in traffic from the toll road. Matakana straight line growth: The original report assumed virtually nil growth, but here I’ve assumed the same growth for Matakana Road as for Sandspit Rd. I’ve assumed 50% of the additional Matakana traffic will take the toll road. The 50/50 split is roughly the split the original report claimed. Although NZTA have since retracted this split, I’ll run with this for now. So there you have it. You can test your own assumptions by downloading the spreadsheet. This is the mess that happens when technocrats are forced to try to justify a politically motivated project that isn’t fit for purpose. It is also a good example of “optimism bias”. This is the main reason I’ve requested to the Board an independent review, rather than rely on the forecast provided by the promoters of the project. It is also a great example of why rational planning is an oxymoron. …and also a good example of why morons and oxymorons seemingly always go hand in hand. And this project is a better priority than the CRL because? (its better than CRL because) Ministers Stephen Joyce and Gerry BrownLee say so and for no other reason. It’s ‘better’ because it can be privatised through a PPP unlike the CRL. Poor financiers have to clip the ticket somehow. Look for a soft contract that puts all the risk with future governments. There are any number of projects that are better than this. Safety upgrades to the existing SH1 between Warkworth and Wellsford, for example. Upgrading the Pohueue viaduct has a benefit cost ratio of greater than 3. That’s the great tragedy of all this. Our limited financial resources are being wasted. This will be decided over the next 12-18 months. It has to go through a process of NZTA analysing it for PPP suitability or not, recommending that to gov, and so on. If not a PPP, and that will depend a great deal on how the Transmission Gully PPP proceeds, then it has to join the queue for PAYGO funding. And, given that Waterview rolls on till 2017, the Waikato Expressway all decade, and the CHCH rebuild, plus the fact that the Transport Fund is down because people aren’t driving so much, then….? That can gets kicked down the road. Here’s hoping, except of course meantime nothing happens for Warkworth or the current unsafe road. Because of this RoNS NZTA are abandoning the existing road until they can palm it off onto the ratepayers of Auckland. Cos remember; this is an Auckland road, it’s not in Northland, no matter how they spin it as regional development. Hi Roger – funding hasn’t been decided. In fact if you search for “$” in the Board of Inquiry documents, you won’t find any reference to the cost of the project, the cost to the community or the benefits. The Govt has signalled that it will be a PPP, but it will be an unattractive one if it is based on the toll collected. Probably the private partner won’t take any risk at all and the contract will be on an availability basis, as is proposed for the Transmission Gully PPP. All of which means pointless expense for the taxpayer. Good point about apportionment on the southbound trips. I imagine that another gantry will have to placed somewhere over the new section if there is going to be an additional charge for using the new toll road. That way users getting on at Puhoi won’t be forced to pay for something they don’t use. Thanks Cam. I think you had an alternative route in mind, for upgrading the existing road- similar to the one I have often imagined:(deviate from the bottom of Schedewys Hill up the gully immediately West of Windy ridge- filling the bottom of the gully would avoid excessive cuts into the hillsides; cutting at Moir Hill Road saddle, then rejoin the existing alignment down past Pohuehue Viaduct: one long, sweeping easy gradient). I like your idea of a local bypass for Warkworth too. This would surely be far less expensive than the huge earthworks and social disruptions involved in creating a whole new road to the west of the present alignment. I think that their grandiose visions of a toll road have blinded them to the less expensive possibilities. Incidentally from a geotech point of view the ground between Puhoi and Perry Road is predominantly Pakiri Formation- the same material as the toll road goes through between Otanerua Viaduct and the tunnels, where it stands firm in stable cuttings. The only unstable part is the weathered material on top, which tends to take off from the bedrock; the bedrock itself is generally hard and stable. With careful geotech design and management of the weathered material, the “unstable ground” issues could be easily dealt with. (I am a geologist working in geotech at the moment).